A soon-to-be-published high fantasy tabletop RPG with fourteen years of play-testing and improving. A new fantasy tabletop RPG featuring a fully developed constructed language and a richly detailed setting for all to explore! This book uses mythology and lore to provide players and GM’s new options for playing deities, fairies, and shamans. An expansion to The Midderlands OSR Setting and Bestiary. Created for OSR roleplaying games, in particular Swords & Wizardry. This 100+ page module is the first chapter of a mega-campaign for 5th Edition D&D (5E) & Pathfinder RPG in hardcovers or PDFs. A ‘Vikingesque’ campaign setting designed for use with the 5th edition and version 3.5 of the world’s most popular RPG. Decades ago, Danforth and Stackpole created a unique solitaire adventure for Tunnels & Trolls. We’re back to make a great new version. Complete The White Ship Campaign with the final 2 adventure volumes in 1E & 5E formats! From the shadows rolls a PolyHero Dice Set for heroes of a more mysterious kind. Rogues, Thieves, Assassins… steal yourself a set! Simple and cheap handmade dice crafted to help bring families together during a game night. Hand-crafted. 100% Handmade from Select Artisan Hardwoods. Unique One of a Kind Dice. Pushing the limits of coin design. Traditional Japanese tattoo art form engraved in Hobo Nickel style. Designed in Japan. Made in USA. $6 pledge! Our third Dice Coins project. Now featuring amazing 3D characters molded into a d20 spinning dice coin. Dice towers inspired by fantasy tropes! These towers are fully engraved, and without the need of a dice tray in front of the tower! I am making the best looking most efficient boxes to store Dice Masters dice in! Call for the favor (or mercy) of Lady Luck on your dice rolls with this shiny gold and hard enamel pin! Over 16 Hours of Cthulhu and horror soundscapes to immerse yourselves in during roleplaying, boardgames and LARP. A children’s book that introduces kids to the endless possibilities in the world of table top role playing games. Campaign Notebook is a hardcover campaign journal for players and GMs with sections for everything. The Armybox Battle Counter is a command board for 40k and in many trays you can store your tabletop equipment clear and comfortable. A 6′ x 4′ highly detailed RPG battle mat, complete with grid, designed so entire adventures can be played out on it. Bokkel magazine brimming with riddles, short stories with a few twists and mental games all fully illustrated. Special Edition. 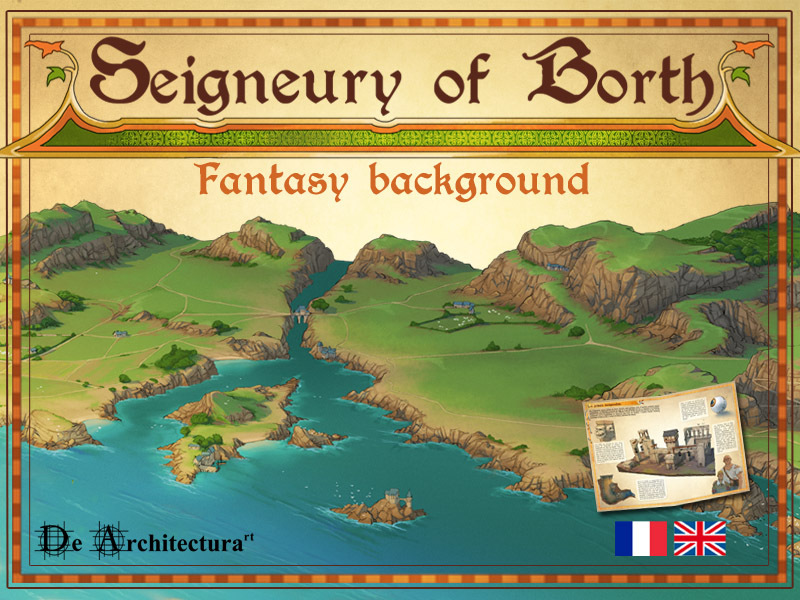 The Seigneury of Borth is an adventure setting for your medieval fantasy game. You can adapt it without any difficulty to your favorite system of rules. La seigneurie de Borth est un mini-cadre de campagne pour votre jeu médiéval fantastique. Vous pourrez l’adapter sans aucune difficulté à votre système de règle préféré. Ispiratevi alle terre e alle leggende norrene e tuffatevi nel mondo fantastico di Trudvang Chronicles insieme a noi. Novela en 4D vol. II: Libro, BSO, ilustraciones y escenario para partidas de rol. El Universo de Acero evoluciona… y es aún más peligroso.